This Trimmer Rack is perfect for semi-pros and small contractors who only need to carry two trimmers. Also popular with larger contractors for carrying "stick edgers" or spare trimmers. •Load or unload a trimmer in 3 seconds. •Trimmer handle rest is on an angle so that trimmer will not stay on the rack unless latched. •3/16" all welded steel construction with a durable powder coat finish. •Locks trimmers individually with standard padlocks. •Latch clips are secured to hinge with a lanyard to prevent loss. •Mounts to open or enclosed trailers (with MB-4 mounting brackets) quickly and easily. 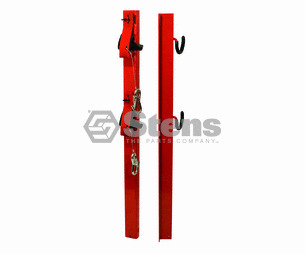 •Attaches to upper and lower rails of trailer creating much stronger mount than racks that attach to the top rail only. •Replaceable handle cradle protects and tightly holds trimmers in place. This Trimmer Rack is perfect for semi-pros and small contractors who only need to carry two trimmers. Timely deliverly. Good price. Thank you Jacks.. These are simple, sturdy, easy to use racks. We have bought several of them for our lawn business and have never had one fail. Ask us about the Trimmer Trap 051237 Trimmer Rack Holds 2 Trimmers. Please no repair questions. Your Q&A may be posted to Jackssmallengines.com to help other shoppers, like you, with their purchasing decisions. Thank you.